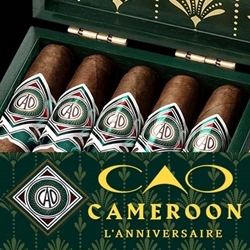 Wrapped in a reddish-brown African Cameroon wrapper, the CAO L’Anniversaire Cameroon is a hand-rolled premium cigar that produces a mild to medium smoke proving a sweet and spicy taste with essence of coffee and caramel. CAO Cameroon are constructed individual by highly skilled cigar rollers using the finest well aged Nicaraguan binders and long-fillers. Every CAO Cameroon premium cigar is boxed-pressed and come in boxes of 20 cigars. Created to celebrate the 30th Anniversary of CAO, the Cameroon is so well produced, it was given a rating of 92 by Cigar Aficionado. Considered one of the mildest cigars of the CAO brand, the Cameroon line are handmade premium cigars that make an excellent choice for any cigar connoisseur. Smokers Discounts has made it easy and affordable to buy premium cigars online. A variety of sizes and flavors are listed below at our discount online cigar store. Each of these styles are in stock and available. Call us for more details!